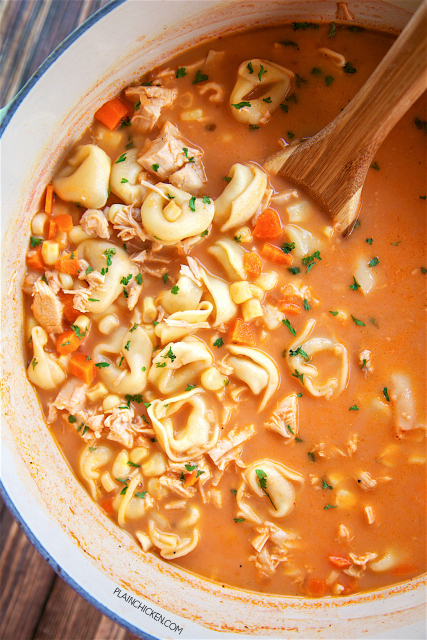 Southwestern Chicken Tortellini Soup - ready in under 30 minutes!! Chicken broth, salsa, carrots, corn, onion, frozen cheese tortellini and evaporated milk. Very hearty soup. Great weeknight meal. Everyone loved this! We ate it for dinner and reheated for lunch the next day. Delicious! It's finally soup season. YAY! 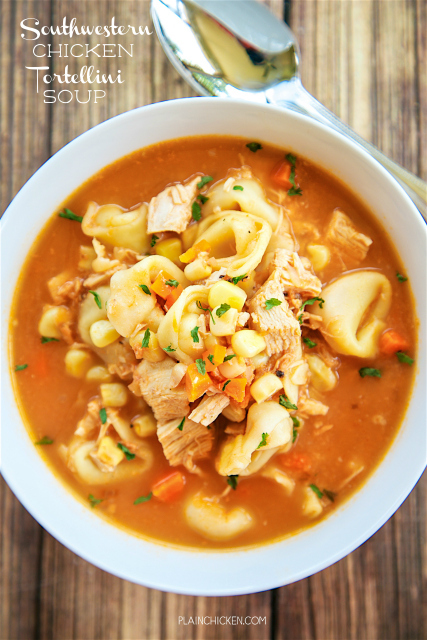 This Southwestern Chicken Tortellini Soup was so simple and tasted fantastic!! The best part is that it only takes less than 30 minutes from start to finish. We loved everything about this soup. You can't go wrong when you start with chicken, salsa, and cheese tortellini. We ate this two days in a row and it tasted just as good reheated the next day. Serve this soup with some quick cornbread muffins for an easy weeknight meal! In a Dutch oven, combine broth, salsa and carrots. Bring to a boil; reduce heat to medium. Slowly boil for 5 minutes, until carrots are tender. Stir in chicken, frozen corn, onion flakes and frozen cheese tortellini. Cook over medium heat for 10 minutes, stirring occasionally. Stir in evaporated milk and cook and additional 5 minutes. Could you omit the chicken and leave the other ingredients the same? I'm not vegetarian, but looking for a few meatless options.